Yes, me and the other guitar player David, play on "Unfleshed" death metal band, and our drummer has other bands like "Pitch Black" thrash metal band. In the past David had some other bands and was the bassist of "Agonizing Terror" death metal band. How is it that you started playing music? I started very young, i was like 13 years old and started playing with an accoustic guitar, playing stuff like Nirvana, Offspring and Metallica etc. What are your names? / Who plays what? / How old are you? I'm César, age 37 (vocals/guitar), David age 40 (guitar), Afonso age 28 ( Drums) and Daniel age 28 (bass). Have you had other previous members? Yes a lot, i'm the only original member now. Did you make music even when you were young? Yes very young, i started composing stuff maybe around 15 years old. Where are you from? We are from Portugal. What year did the band form? 1998. What's your style of genre? We mix a bit, we have classic death metal, swedish death metal, thrash and some black metal. What inspires you? My passion about metal and music in general, it's just what i love the most in life. How have you developed since you started with the music? I evolved a lot, not a very technical guitar player, but i evolved my composition and creativity in general. Yes i make sound tracks for video and short films, and i do sound enginering. All other work is only for money purposes i don't really like it so much! Are you looking for a booking agency, and what are your thoughts around that? Yes we are thinking about using booking agencies and a P.R., it's not so easy to promote a band nowadays with all the competition, and extra promotion always helps. Are you looking for a label, and what are your thoughts around that? We already worked with locals labels, but a bigger label would be nice, if they could purpose a good deal of course. He have had some offers before, but all bad deals, so we will keep waiting for the one! What are your songs about? A lot of stuff...normally about society, politics, human kind, religion, mithology. Who does the composing and writes the lyrics? Normally me and David do most of the composition and lyrics, but all the band participates in every song. Do you start with the music or the lyrics? It depends, it's always a natural process, we never know how the next song will start. Do you compose in a certain inviroment? It's random really, i have composed songs in all kinds of environments and situations. What language do you sing in? In English, but we have a short song in Portuguese. What ages are most of your concert attendants? All ages around 15 to 50. Do you always play the same songs live, or do you vary? We try to vary, we have several influences, so we try to adapt depending on the event. Do you have a regular place you play live often? Yes, or main playing spot is "Metalpoint" in Porto. What was your latest gig? The latest was in Viana do Castelo with Analepsy for the Swr Barroselas Warmup. Have you had to cancel a gig? Unfortunatly yes, once or twice, for family or health problems. Where do you plan to gig the comming year? Well plan to go most places we can inside Portugal, and maybe start exploring some places in Europe that are relatively close, for now. When did you start to sell merchandise, and what do you have for sale? We started in 2010, selling our Ep and t-shirts, now we still have some merchandise from that time, but also have our 2017 album " Violent Nom Conformity", and will release a new album and T-shirts now September 2018. Where can people buy your merchandise? 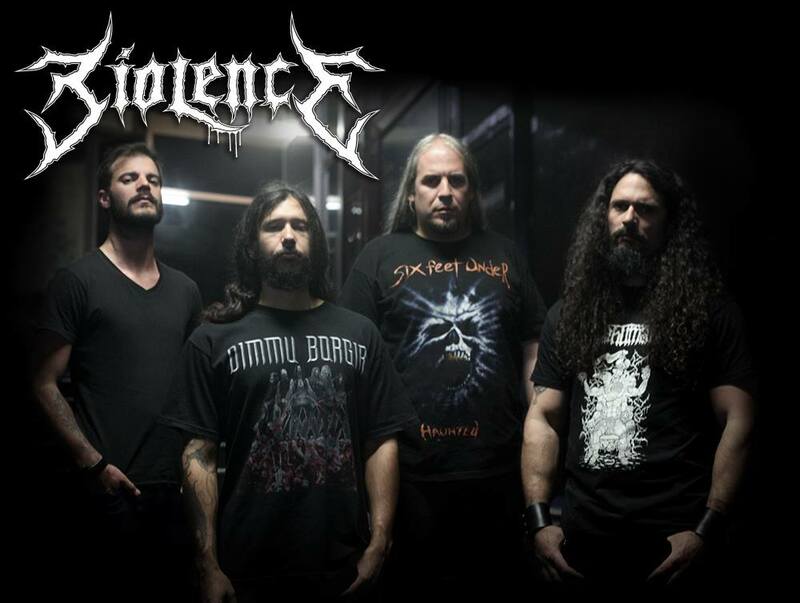 You can do it through our facebook, bandcamp, big cartel or cdbaby, you just search Biolence and we are there. What do you think about people downloading music instead of buying records now a days? It depends if people pay for downloads or just download for free. Obviously if the band doesn't have income, it's hard to invest in new stuff and keep growing. Nowadays there are a lot more bands in the market, it's not so easy to be successful, or to reach a big audience, in the other hand it's a lot easier to promote using internet tools. Bands nowadays have to rely on wearable merchandise to have money to invest on new releases, cds don't sell much now. What do you think of my work? You're doing a great job, nice promotion and info about the bands, and you have a lot of followers that proves what i'm writing. How do you think and know that this interview will help you in the music business? It helps a lot, we need visibility, and being a subjet on your page it's awesome, and of course, you being from Sweden is awesome, metal music in there, is much more respected than in Portugal. Is it easier to find inspiration from older bands, or bands that are more active today? Yes, actually we only find inspiration in bands from the 90's, for us it's the best decade for metal music. What have been your biggest obstacles? Line up changes in the band, we had a lot, when finally things would begin to get better, we would loose some member, because of family,work, incompetence or something like that. But now we have a strong formation. What advice would you give other bands or artists? Don't stop or you die, and always be honest about the music you play, don't make it just to sell. Do you have any new material? We will release new album and new merchandise exactly this month (September 2018), stay tuned! What are your web sites? You can just search "Biolence" on facebook, twitter, bandcamp, big cartel, cd baby and some others. How can people reach you? Facebook or email is the best way for us. What are your plans for the future? Composing new albuns, promote them live and the repeat the process.